Aretha Franklin, the undisputed “Queen of Soul,” whose opulent five-octave vocal range elevated her to stratospheric stardom, was often described as an anointed gift from God. This spiritual endowment manifested into a legendary singing and recording career that spanned 62 years in gospel, R&B, pop, jazz, blues, and even classical genres of music. On Thursday, Aug. 16, after a battle with cancer, God called Aretha Franklin home to glory, silencing her “live voice” on earth forever. She was 76. Born March 25, 1942, in Memphis, Tennessee, Aretha Louise Franklin and her four siblings (Erma, Carolyn, Cecil, Vaughn), along with their father, Rev. Clarence LaVaughn “C.L.” Franklin and mother, Barbara Siggers Franklin, moved to Detroit in 1946. Rev. Franklin served as senior pastor of New Bethel Baptist Church for almost 40 years. He was nationally revered for his electrifying preaching, speaking and singing, earning him the title, “The Man with the Million Dollar Voice.” He was also a prominent civil rights leader. Barbara Franklin, who sang gospel and played piano, passed when Aretha was 10. It was at New Bethel, where a young Aretha’s love for singing gospel took deep roots. As a five-year-old, she was known as this little girl with the big voice. In addition to being a child prodigy vocally, young Aretha raised eyebrows with her uncanny ability to play piano, which was self-taught. It benefited Franklin to hear her father sing constantly, which gave her inspiration to emulate his vocal acumen. In addition, she met gospel legends, such as Clara Ward, Mahalia Jackson, James Cleveland, Albertina Walker, all of whom were frequent visitors to the Franklin home in Detroit. At 14 years old, Franklin was ready for the world, and the world was ready for her. She recorded and released her first album, entitled, (Spirituals) Songs for Faith.” The gospel album, recorded in front of a live audience at New Bethel, was released on Detroit-based J.V.B. Records in 1956. While Franklin loved gospel music, with all of her heart and soul, she also loved the secular music played on two local Detroit soul/R&B radio stations, which at the time were, WCHB (1440 AM) and WJLB (1400 AM). In addition, the storied CKLW, a radio station across the Detroit River in Windsor, Ontario Canada, was another powerful source that played the hot soul and R&B music Aretha listened to and loved. Franklin wanted to make the quantum leap from gospel to soul and R&B music. Many music historians believed Franklin watched the career move of Sam Cooke from gospel to secular, realizing it was possible for her. Cooke was the lead vocalist of the “Soul Stirrers,” a top gospel group at the time. He was friends with Rev. Franklin, and he visited the Franklin home many times, both as a gospel star and pop/R&B standout. His first hit on the R&B/pop chart was “You Send Me” in 1957. In 1960, Franklin made her move to secular music when she inked a recording deal with Columbia Records. Moving to New York, Franklin released her first album for the label, entitled “Aretha: With the Ray Bryant Combo.” The album had a mixture of songs that were classified as jazz, blues, pop and R&B. The first single released, “Won’t Be Long” reached No. 7 on Billboards’ R&B chart. Other singles from Franklin’s debut album on Columbia were “Operation Heartbreak,” which hit No. 6 and “Today I Sing the Blues,” which checked in at No. 10. Following her debut album, Franklin’s next eight albums for Columbia failed to place a top-ten single. 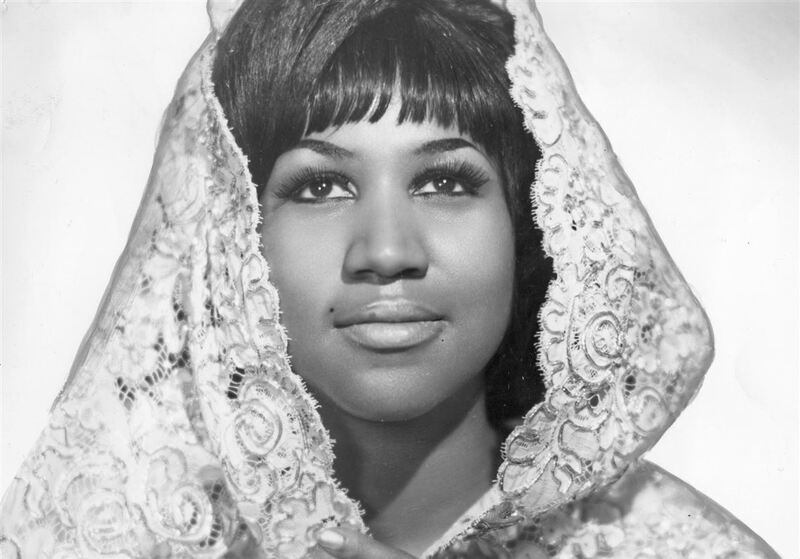 After the release of her ninth album for Columbia in 1967, Franklin signed with Atlantic Records. The first album released on the new label was, “I Never Loved a Man the Way I Love You,” which was also the title of her first No. 1 hit. Next was “Respect,” a cover of crooner Otis Redding’s classic song, which reached No. 1 for Franklin. The title of the song (“Respect”) and its catch-phrase lyrics of 1967, became a national anthem and expressions for the growing women and Black Power movements in America. Other chart-topping songs during Franklin’s 12 years with Atlantic included, “Baby I Love You,” “Chain of Fools,” “(Sweet Sweet Baby) Since You’ve Been Gone,” “Think,” “Call Me,” “Don’t Play That Song (You Lied),” “Bridge Over Troubled Water,” “Spanish Harlem,” “Day Dreaming,” “Angel,” “Until You Come Back to Me (That’s What I’m Gonna Do),” “I’m in Love,” “Something He Can Feel.” Her final No. 1 single on Atlantic was “Break It to Me Gently” in 1977. While Franklin had a multiplicity of hit albums and singles with Atlantic, in 1980, she moved to Arista Records, under the auspices of the label’s legendary founder and president, Clive Davis. Franklin’s switch to Arista paid immediate dividends, when “Jump to It” vaulted to No. 1. Luther Vandross wrote the song. Franklin and Vandross collaborated again to deliver “Get it Right” to the No. 1 spot on Billboard. Vandross sang background on both hits. “Freeway of Love,” produced by Kalamazoo, Michigan native, Narada Michael Walden, reached No.1 for Franklin, as did her duet with George Michael, “I Knew You Were Waiting (For Me).” Over her 27 years with Arista, Aretha recorded 17 songs that charted on Billboard’s Top-20. Over her six-plus-decades in music, Franklin recorded 41 studio albums. The last two were “Aretha Franklin Sings the Great Diva Classics” (2014) and “A Brand New Me” (2017). She charted more than 100 hit singles, 20 of which were No. 1 songs. Franklin garnered 18 Grammy Awards; three Grammy Special Awards, one of which was the Lifetime Achievement Award; three NAACP Image Awards; and The Presidential Medal of Freedom. Franklin is the first female to be inducted in the Rock and Roll Hall of Fame. She performed at the presidential inaugurations of Jimmy Carter, Bill Clinton and Barack Obama. Franklin was the recipient of numerous honorary doctorate degrees, the first of which was presented in 1975 by Bethune Cookman University, an HBCU in Daytona Beach, Florida. There were many defining moments and achievements in Franklin’s life that proved she was the undisputed greatest singer on earth. Yet, a no-doubt moment that further branded Franklin as the world’s most certifiable diva occurred at the 1998 Grammy Awards program. With no time to rehearse, Franklin boldly stepped on the stage at the Grammys and sang the operatic classic to perfection. Franklin received a long standing ovation and earned tremendous praise from the opera world. Millions of viewers across the nation and beyond watched Franklin’s operatic performance in awe, leaving no question she was the world’s best ,most versatile and talented diva, which by the way is defined as a super special female opera singer. Franklin simply proved that night at the Grammys, in front of her peers and millions of television viewers, what the world knew for decades: she was the Grand Diva of them all, and the “G.O.A.T.” (The Greatest of all Time).